All too often, foundations, non-profits and volunteers work tirelessly in the background without any hope or desire for recognition. Fortunately, thanks to a new radio show known as “An Hour to Give”, The Foundation (WCPD) was able to shine a spotlight on two outstanding charitable organizations and the incredible work they are doing in our nation’s capital. 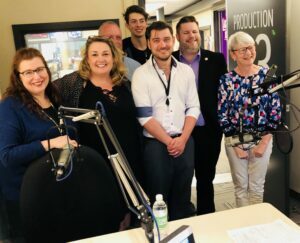 The show, which was broadcast on May 19 after the Royal Wedding on 1310 News, highlighted both the Ottawa Senators Foundation and the Canadian National Institute for the Blind (CNIB). The Foundation (WCPD) purchased the show and gifted it to the two organizations, thereby taking the spirit of “An Hour to Give” literally. You can listen to the recorded podcasts here. First up was Danielle Robinson, President & CEO of the Ottawa Senators Foundation, who described not only how she first got involved with the organization more than 13 years ago, but how much it has evolved to serve the community. 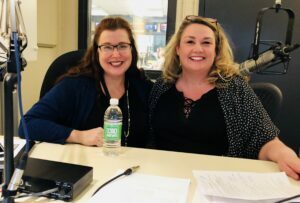 Danielle Robinson, left, President of the Sens Foundation, joined host Sam Laprade on “An Hour to Give”. “At least one part of my day is being spent on changing a life in our community, and I feel very blessed by that,” she said. Robinson explained how the Ottawa Senators Foundation, a stand-alone charitable entity, is focused on social recreation education and mental health. While the foundation is involved in several signature events and supporting many community partners, she identified Sens Camperships as one area of particular focus now and in the future. Stephen Pearson from the Lowertown Community Resource Centre can attest to the Ottawa Senators Foundation’s major impact in the lives of young Canadians. Since 1970, this organization has provided a myriad of services for this area of Ottawa. In addition, it offers an Early Years Program, After School Program and March Break Camps. “And also thanks to the support of the Senators Foundation and others we are able to run a great summer cap every year. And all of the services we offer to the people of Lowertown are free of charge,” Pearson added, who joined the organization after teaching high school for 25 years. The second part “An Hour to Give” was donated to CNIB, an organization that, incredibly, is now celebrating its 100th year. Jane Beaumont, a past Chair of the National Board of Directors, and the present CNIB Archivist, offered some rich history on how the organization came into being more than a century ago. Jeff Todd, centre, Director of Communications at The Foundation WCPD, drops in on the recording at 1310 News. In fact, even before CNIB was officially founded, she revealed that the first library for the blind was established all the way back in 1906. CNIB as we know it today came together years later in the aftermath of First World War and the infamous Halifax Explosion, when hundreds, if not thousands of Canadians either lost their vision or became partially sighted. Bringing us into modern times, Duane Morgan, the Executive Director for Ontario East, described just how much technology is now making a difference in the lives of Canadians with blindness or partial vision loss. “We really want to focus on some of those things that have been really big game changers for people, such as technology,” Morgan said. “And not just those traditional adaptive technologies that have cost so much money for people to get in to, but looking at things that are mainstream, such as smartphones and tablets. Laprade, the host of the show, also noted a statistic that every 12 minutes a Canadian begins to lose their eye sight. In response, Morgan added that societal integration is also a huge part of that they do at CNIB, in terms of Canada being an inclusive place for everyone. One major aspect of this integration is ensuring that the blind and partially sighted have access to employment opportunities. “A job is much more than just a pay cheque. It is a means of self-reliance and a person’s self-identification. We know that is very important to people,” he explained. “An Hour to Give” is broadcast every Saturday on 1310 News from 7am to 8am. You can learn more about the program here.